Love her skirt – so vibrant – beautiful!! Again we see the huge chunky (ugly) sneaker…the new fade,that took off when Balenciaga launched the Triple S…y’all getting used to new look and proportions? Not quite yet, de la Haye. Feel like I haven’t gotten my money’s worth out of some purchases. My prob (and the same for most of us on this beloved blog, I suspect) is that I buy too much of stuff I like, then the style changes. I think I’m single-handedly keeping my local consignment shops in biz! Countyd…they say that fashion constantly changes and that style remains…nowadays style moves at such pace that it is not considered stylish…style needs time to develop and evolve…at the pace fashion moves along and the choices it has to offer each and every fashion season…it’s hard choosing! 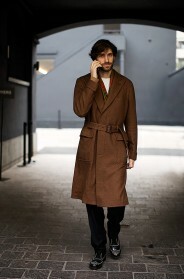 He his Giovanni Bianco, Vogue Italia Creative Director. So what…who cares…doesn’t make him more stylish. Title means nothing. Fashion is a matter of opinion. The sneakers are a fad and will die out and change soon enough. Very beautiful combination of prints. I lo-lo-love the girl’s look. I love animal prints with flower prints and white to tone everything down. And I love that she has almost no make up and free casual hairstyle. This is so fresh and polished. In love with her skirt and the mix of prints! She looks great from the calf up. The shoes are awful and his, too. simple and chic — a manageable and charming effect that more people should aspire to. He looks dreadful: the wallet chain, the necklace, the extra shirt material, and the horrifying shoes. I wonder if they’re arguing about RJH de la Haye’s criticism of the extreme chunk of the guy’s shoes. She is insisting that the guy definitely fell off the sprezzatura wagon. The guy is insisting that the club foot look is the new bella figura. Fell off the sprezzatura wagon + The club foot look is the new bella figura…John from Philly…you’ve just made the wittiest quotes on the blog this season…BRAVO! I really enjoy the intra-community discussions here! Yeah, I didn’t think that was a “pinch of salt” gesture, either. Love the passionate moment caught like this. Plain vs. Pattern. Who wins? Both of them look gorgeous!. She looks fantastic with white shirt pairing with vibrant colored pant and chunky pair of shoes. Check out the beautiful designer collection of clothes at https://www.yoyo.fashion/. Where can I find her shoes!? I love the lady. Fantastic effortless style. Seeing her makes me love fashion much more again. And Milano.